One of our most popular deals of the year is back! Get the KeySmart 2.0 for just $17, with optional 8GB flash drive. Keys are an age-old form of security that, for the most part, still hasn’t gone digital. We all walk around with this collection of oddly shaped metal objects kept together by the classic key ring, enemy to fingernails everywhere, so we can lock and unlock doors at our homes, in our cars, and out and about. But while it’s not easy to instantly make your keys disappear in favor of a digital solution, you can instantly make them a lot more organized and convenient with one easy tool: the KeySmart 2.0. Get it now for just $17 with extender at TNW Deals, including free shipping. Collecting your keys in a swiss-army style tool, the innovative KeySmart utilizes clever design to fit all your keys into one nifty shape. That means no more spikey ball of keys that protrudes from your pocket and pushes into your leg. No more mess trying to find the individual key you’re looking for out of the 10+ on your keychain. 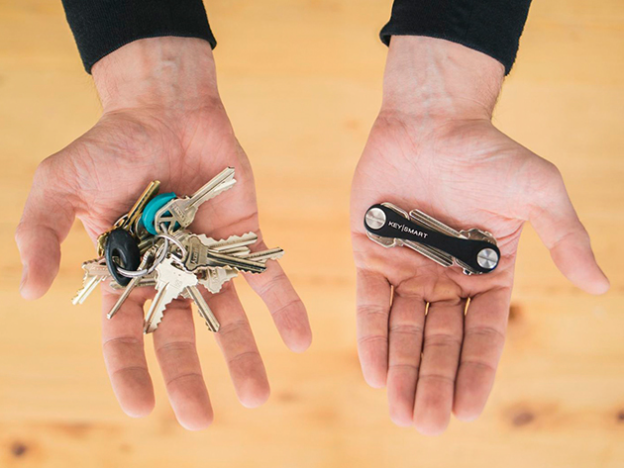 With the included expansion pack, you can fit up to 10 keys on the KeySmart, as well as your car key, key fob or other keychains with the included loop piece. The frame is crafted from aircraft grade aluminum, so it’s sure to be strong enough to hold your keys. You can also get accessories like a USB stick to add to your KeySmart. It’s normally $23, but our discount gets you this lifesaver at just $17 with free shipping. That’s a small price to pay to organize and consolidate something you carry around with you literally every day.